Maxine D. Smith, 83, of Warren, PA died Wednesday evening, July 11, 2012 in St. Vincent HeathCare, Erie, PA following a brief illness. Born November 3, 1928 in Erie to the late Louis and Clare Beckwith Miller, she was a graduate of both Mt. Vernon Academy H.S. and Loma Linda University. Maxine was a first grade teacher at Corry Elementary School. She was a member of the Seventh Day Adventist Church in Russell, PA where she held several offices in the church. She was active in the Warren Senior Center. 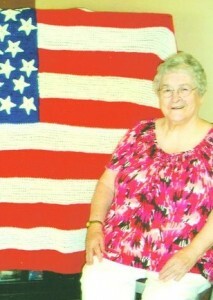 Maxine was proud to support the Honor Bus Tour; she had knitted, without pattern, an American Flag, and donated her work to Warren/ Forest Elder Council. She is survived by three sons – Ivan F. Smith, Jr. and his wife, Michelle of Russell, Duane Smith and his wife, Joanne of Busti, NY, and Dale Smith and his wife, Sandra of Sugar Grove, PA; a daughter – Erika Jones and her husband, Lorian of Sacramento, CA; a brother – Duane Beckwith and his wife, Janet of Corry, PA; a sister – Shirley Beckwith of Russell; and several grandchildren, great grandchildren, nieces and nephews. In addition to her parents, she was preceded in death by her husband of 49 years – Ivan F. Smith, Sr.; and a granddaughter – Deena Smith Littlefield. Friends may call at the Seventh Day Adventist Church, 6616 Market St, Russell PA 16345-1144 from 3:00 until 4:00PM Sunday, July 15, 2012 when a memorial service will be conducted by Rev. Lynn Gatz. A fellowship luncheon will follow the service. In lieu of flowers, memorial contributions may be directed to the Seventh Day Adventist Church at the above address. Online condolences may be offered to the family at www.lewisfuneralhomeinc.com. The Donald E. Lewis Funeral Home, Inc. is assisting the family with arrangements. THE LOSS AND WISH TO EXPRESS OUR DEEPEST SYMPATHY TO ALL OF THE FAMILY. Sending my deepest sympathy during your time of sorrow. I had the privlidge and honor of not only getting to know Maxine but growing to love her during and after my work at Cambridge. I have so many great memories with Maxine-our love for creativity and art, bingo, having fashion shows in her room when I tried on her handmade hats, special dinners set up in the back activities room, our (almost) daily phone calls, card games, decorating her room and door for Christmas and many more. Most of all, I will remember Maxine for her love, support, encouragment and confidence she gave me, her warm and generous smile, her faith and love for God, and her positive outlook on life. Maxine will be greatly missed and I will always hold a special place in my heart for her. Thoughts and Prayers are with you all. My sincere sympathy to all of you. I knew your mother many, many years ago and she was such a wonderful lady. My prayers are with you during this difficult time. My sincere sympathy goes out to the entire family.Icome to know your mother when i took care of her when she lived in Russell, and then when she was at the wARREN manor nursing home.She taught alot about life and cooking,especially when i was cooking something for her I Will never forget the times i had and spent with her.Ireally enjoyed going with her to the senior center., and when i took her to bingo up to salamanca,that was fun.Maxine you will be greatly missed but never frogotten by me.Ireally loved your mom she was a great lady..I Want to let you all know i,m really glad i had the chance to take care of your mother over the years it was a great pleasure.to have cared for such a nice lady. god bless to all of you and take caregood care of yourselfs and just know i,m with you guys in thought and prayer. Love Laura Ruland, a fromer caregiver to maxine. .
Prayers to Maxine’s family and friends. I had the honors of knowing Maxine, she had a wonderful impact on my life. We shared the same faith and sense of humor. I will miss her, but in the same sense I enjoyed and was Blessed with the moments we did share. GOD Bless you & yours.